Raederle: Fruitarian Diet | Is It Nutritionally Sound? Fruitarian Diet | Is It Nutritionally Sound? Is it possible to live entirely on fruit? To find the answer I've finally done the number punching. Below are some examples of a diet that meets standard nutritional recommendations. Meets nutritional needs for B1-B9, A, D, E, K, Calcium, Copper, Iron, Magnesium, Manganese, Phosphorus, Potassium, Selenium, Zinc, Omega-3 and Omega-6. This also provides 54 grams of protein, which is more than enough for the average adult. This does not meet nutritional needs for sodium. It only meets 18% of the nutritional need for sodium. A half teaspoon of sea salt would provide the rest of the needed sodium. This could be added to the grapefruit, or to a smoothie containing the bananas and goji berries, or to a dish containing diced cucumber and avocado. Meets nutritional needs for B1-B9, A, D, E, K, Calcium, Copper, Iron, Magnesium, Manganese, Phosphorus, Potassium, Selenium, Zinc, Omega-3 and Omega-6. This also provides 61 grams of protein, which is more than enough for the average adult. This does not meet nutritional needs for sodium. It only meets 30% of the nutritional need for sodium. A half teaspoon of sea salt would provide the rest of the needed sodium. I think the two above examples prove that it is possible to live off of fruit according to RDA standards. However, as I've stated, I don't think it would be wise to live fully off of fruit. For example, what about chlorophyll? Evidence shows many benefits of consuming chlorophyll which is primarily found in leafy greens. Let's now see how low we can get the calories by including just a couple key foods to provide some of the tough minerals like calcium, iron, zinc and selenium. Meets nutritional needs for B1-B9, A, D, E, K, Calcium, Copper, Iron, Magnesium, Manganese, Phosphorus, Potassium, Selenium, Zinc, Omega-3 and Omega-6. This also provides 54.4 grams of protein, which is more than enough for the average adult. This does not meet nutritional needs for sodium. It only meets 44% of the nutritional need for sodium. A half teaspoon of sea salt (or less) would provide the rest of the needed sodium. The above example is to show how an almost entirely fruit diet can meet nutritional recommendations near 2000 calories instead of 3000 calories. Being flexible enough to eat watercress, basil and half a Brazil nut makes the difference of 1000 calories. All three of the above examples would require living off the land or having a lot of money, as you may have noticed. Can we improve that perhaps? Meets nutritional needs for B1-B9, A, D, E, K, Calcium, Copper, Iron, Magnesium, Manganese, Phosphorus, Potassium, Selenium, Zinc, Omega-3 and Omega-6. This also provides 48.7 grams of protein, which is enough for the average adult. This does not meet nutritional needs for sodium. It only meets 67% of the nutritional need for sodium. A quarter teaspoon of sea salt would provide the rest of the needed sodium. To buy the above at my local grocery store, entirely organic, would cost around... $37! So, yes, it makes a lot more sense to get a siginificant amount of nutrition from seeds and vegetables. Of course, if you have an orange tree, a fig tree, an apple tree, etc, it makes most sense to utilize the wonderful source of fresh fruit. In my meal plans I illustrate a nutritionally complete raw vegan diet that averages 40% from fruit, 40% from vegetables and 19% from seeds and 1% from nuts. Except, of course, Nut-Free Delectable Delights 7-Day Meal Plan doesn't contain nuts at all. Personally, in cutting back my own cost of living and in searching for the optimal raw vegan diet, I find that this balance (40% fruit, 40% vegetable, 19% seed, 1% nuts) works best. This balance is by calorie, not by volume. So I get about 40% of my calories from fruits, 40% of my calories from vegetables, 19% of my calories from seeds and 1% of my calories from nuts. This works out about like this: 69% calories from carbs, 20% calories from fats, 11% calories from protein. Note that this is not far off from the 80-10-10 diet. I could eat less fat in proportion to how much carbs and protein I ate if I could afford to eat more fruit, less seeds and a higher calorie diet. Of course, it also helps how you buy your fruit. My husband and I buy bananas by the box, getting 40lbs of organic bananas (75 bananas) for $25.00. That is 33 cents per banana or 62 cents a pound. We also regularly buy a box of 72 organic oranges which costs us $45, and boxes of kiwis as well. 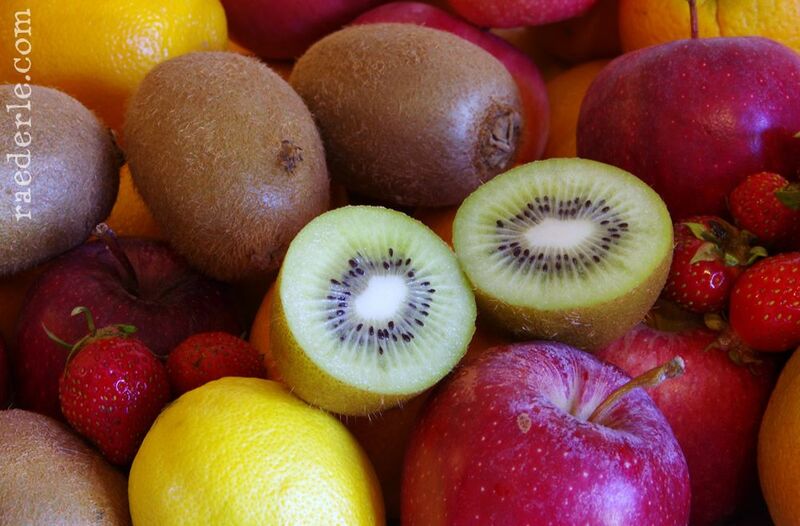 Kiwis are great because they keep on the counter a long time. Oranges are great because they keep well in the fridge for a long time. Bananas are great because they can be frozen, consumed as smoothies or ice-cream and they can also be dehydrated. 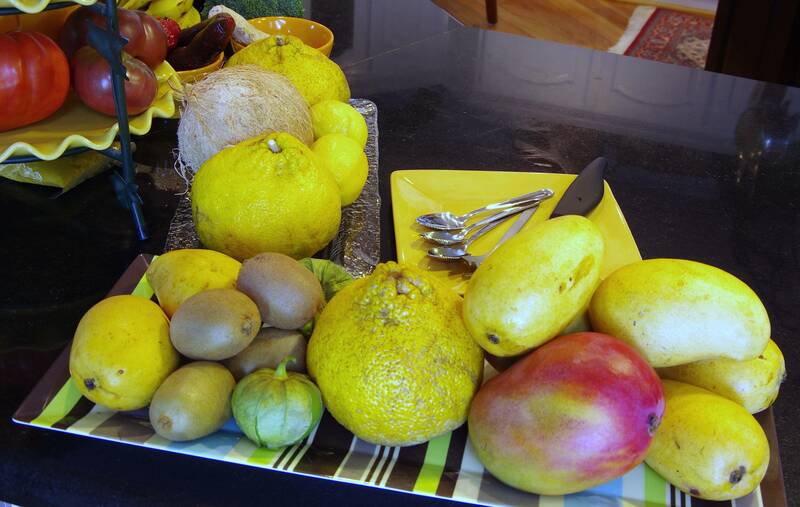 These three fruits are very ideal for bulk purchases even for small families. We also buy nori sheets in bulk, a dried sea vegetable, with the end price being about 30 cents per nori sheet. If you buy them by the ten pack at the store you end up paying 45 to 60 cents per nori sheet. We love making nori wraps on a nearly daily basis. We've also bought boxes of organic dates online for much less than $9 a pound. Dates can be stored for years in the freezer. An all-fruit diet is possible, but requires a diet that is around 3000 calories a day or more. An all-fruit diet would be appropriate for athletes or people who are very active and live off their own fruit-rich land. A mostly fruit diet would be appropriate for many raw vegans who can afford to spend a lot of money on fruit. If you're interested in a raw vegan diet that is nutritionally complete, packed with delicious easy recipes, and gives you all the detailed directions needed to succeed then check out my meal plans. Thanks for reading and helping me bust myths about a fruitarian diet...!